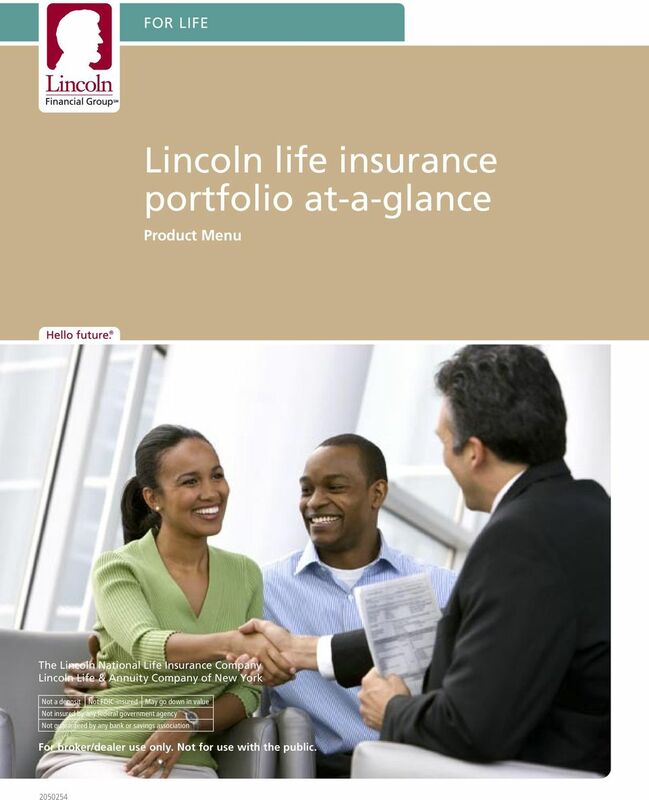 Download "Lincoln life insurance portfolio at-a-glance"
2 Lincoln for Life the leading choice The Lincoln National Life Insurance Company and Lincoln Life & Annuity Company of New York are ranked #1 for total life insurance sales in When you re seeking... 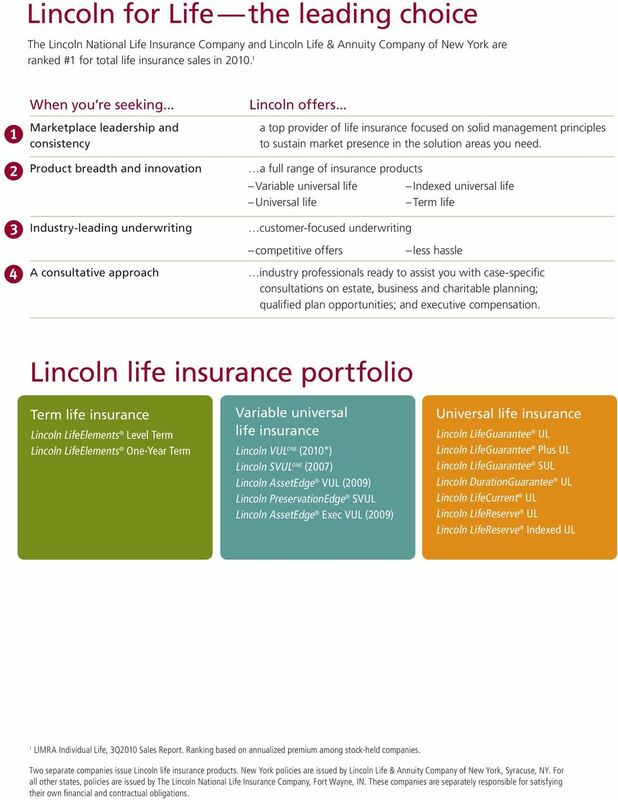 Marketplace leadership and consistency Product breadth and innovation Industry-leading underwriting A consultative approach Lincoln offers... a top provider of life insurance focused on solid management principles to sustain market presence in the solution areas you need. a full range of insurance products Variable universal life Universal life customer-focused underwriting Indexed universal life Term life competitive offers less hassle industry professionals ready to assist you with case-specific consultations on estate, business and charitable planning; qualified plan opportunities; and executive compensation. Lincoln life insurance portfolio Term life insurance Lincoln LifeElements Level Term Lincoln LifeElements One-Year Term Variable universal life insurance Lincoln VUL ONE (2010*) Lincoln SVUL ONE (2007) Lincoln AssetEdge VUL (2009) Lincoln PreservationEdge SVUL Lincoln AssetEdge Exec VUL (2009) Universal life insurance Lincoln LifeGuarantee UL Lincoln LifeGuarantee Plus UL Lincoln LifeGuarantee SUL Lincoln DurationGuarantee UL Lincoln LifeCurrent UL Lincoln LifeReserve UL Lincoln LifeReserve Indexed UL 1 LIMRA Individual Life, 3Q2010 Sales Report. Ranking based on annualized premium among stock-held companies. Two separate companies issue Lincoln life insurance products. New York policies are issued by Lincoln Life & Annuity Company of New York, Syracuse, NY. For all other states, policies are issued by The Lincoln National Life Insurance Company, Fort Wayne, IN. These companies are separately responsible for satisfying their own financial and contractual obligations. 3 Term Core positioning Lincoln LifeElements Level Term Life insurance protection with guaranteed level premiums (10, 15, 20 or 30 years) Lincoln LifeElements One-Year Term Temporary one-year life insurance protection Not renewable or convertible Key benefits Provides clients with affordable life insurance protection Offers clients the choice of guaranteed level premium period (10,15, 20 or 30 years) Offers clients the chance to enhance their policies by choosing from a selection of riders Provides clients with one year of life insurance protection Unique features Affordable level term coverage guaranteed for a specific period of time All rates are unisex Prospect needs Buy-Sell Replace income Sales applications Buy-Sell/Key person Survivorship Paid Up Funding Mortgage protection Provides temporary insurance while clients are making longer-term financial decisions Underwriting classes and issue ages 10-year (18 70 in NY and WA) 15-year year year nontobacco year tobacco Standard 0 99 Substandard (smoker) 0 99 Minimum specified amount $250,000 $1,000 Riders Accelerated Benefits 4 Waiver of Premium 1 None Not all riders are available. 1 Available at an additional cost. 2 Not available in New York. 3 Please see prospectus for additional information, including possible additional costs. 4 One-time charge applied when benefit is exercised. 5 Not available in CT, MD and PA. Guarantees are backed by the claims-paying ability of the appropriate issuing company. 4 No-Lapse Guarantee VUL Core positioning Lincoln VUL ONE (2010*) Lincoln SVUL ONE (2007) Lincoln AssetEdge VUL Guaranteed No-Lapse death benefit Upside growth potential for account value Guaranteed No-Lapse death benefit payable upon second death Upside growth potential for account value Account value-oriented and liquidity potential Key benefits Guaranteed death benefit protection Ability to pass on a valuable legacy Freedom to invest in a diverse portfolio Guaranteed death benefit protection Ability to pass on a valuable legacy when the second of two insureds dies Freedom to invest in a diverse portfolio Ability to pass on a valuable legacy Freedom to invest in a diverse portfolio 10- to 20-year No-Lapse Protection Unique features Reset feature potential for account value growth to eliminate premiums Premium Reserve Rider supplement retirement income without impacting guarantees Client-directed investment options using the Lincoln Elite Series of Funds, including the Profile Funds managed by Wilshire Associates and options from State Street Global Advisors (SSgA) High rolling target premiums Choice of GPT or CVAT Reset feature potential for account value growth to eliminate premiums Premium Reserve Rider supplement retirement income without impacting guarantees Client-directed investment options using the Lincoln Elite Series of Funds, including the Profile Funds managed by Wilshire Associates and options from SSgA High rolling target premiums Significant potential for account value accumulation and liquidity for retirement income Client-directed investment options using the Lincoln Elite Series of Funds, including the Profile Funds managed by Wilshire Associates and options from SSgA Rolling target premiums Choice of GPT or CVAT (not available under issue age 15) Prospect needs Supplemental retirement income /retirement income Sales applications SLAT/Private Value Access Family (B) Trust single premium Roth conversion alternative Single premium scenario Pension max Charitable gifting DCA premiums 1st year/1035 ILIT/Dynasty Trusts Survivorship Paid Up at First Death potential Estate equalization Roth conversion alternative Charitable gifting strategies DCA premiums 1st year/1035 Deferred Comp/SERP/162 Bonus Flexible premium design Return of Premium DB option Roth conversion alternative DCA premiums 1st year/1035 Underwriting classes and issue ages Preferred nontobacco and tobacco Standard nontobacco and tobacco Preferred nontobacco Standard nontobacco and tobacco Preferred nontobacco and tobacco Standard nontobacco 0 85 Standard nontobacco NY Standard tobacco Minimum specified amount $100,000 $250,000 $100,000 Riders Optimal No-Lapse Enhancement (ONE) Accelerated Benefit 2,4 Benefit Selection Option 3 Change of Insured 3 Enhanced Surrender Value 1,2 Premium Reserve 3 Waiver of Monthly Deduction 1 Optimal No-Lapse Enhancement (ONE) Benefit Selection Option 3 Enhanced Surrender Value 1,2 Premium Reserve 3 Accelerated Benefit 2,4 Accelerated Benefit (with Critical Illness) 2,4 Benefit Selection Option 3 Change of Insured 3 Enhanced Surrender Value 1,2 Waiver of Monthly Deduction 1 *Lincoln VUL ONE 2007 applicable to policies issued on or after February 15, 2010, subject to state availability. The 2010 update to this product may also be administratively referred to as Lincoln VUL ONE (2010). 6 No-Lapse Guarantee UL Lincoln LifeGuarantee Plus UL Lincoln DurationGuarantee UL Lincoln LifeGuarantee SUL Universal life insurance with a lifetime secondary guarantee and more policy value than Lincoln LifeGuarantee UL Cost-efficient, guaranteed universal life insurance protection for durations of 10, 15, 20, 25 or 30 years, or to age 95 Universal life insurance with a lifetime secondary death benefit guarantee on two lives, payable upon the second death Lets clients protect what s most important with a death benefit that can be guaranteed Offers guaranteed premiums Allows clients to fund their policies so that they can build policy value over time Shorter guaranteed duration coverage at older ages 1035 rollover capability for short duration guaranteed coverage at all ages A powerful tool for estate planning that can provide an affordable lifetime guaranteed death benefit to beneficiaries when the second of the two insureds dies Offers guaranteed premiums Higher cash value and guaranteed death benefit premiums than Lincoln LifeGuarantee UL Guaranteed Issue availability Premium relief feature 1035 exchange forgiveness feature Premium relief feature and 1035 exchange forgiveness feature Premium relief feature 1035 exchange forgiveness feature Flex Option allows for a funding strategy to minimize initial premiums and pay higher premiums in the later years Business transition SLAT/Private Value Access Term vs. permanent/rated Annuity Max/IRA Max Key person Buy-Sell funding strategies ILIT, FLP Buy-Sell funding ILIT/Dynasty Trust Private Split Dollar/Pricing Financing Roth alternative Preferred nontobacco and tobacco Standard nontobacco and tobacco Simplified Issue Guaranteed Issue Duration Preferred nontobacco yr. 15-yr. 20-yr. 25-yr. 30-yr. To age 95 Standard nontobacco Standard tobacco Preferred Plus & Preferred nontobacco and tobacco Standard nontobacco and tobacco $100,000 ($60,000 Guaranteed Issue) $100,000 ($60,000 Guaranteed Issue) $100,000 Minimum Death Benefit Spouse Term 1,2 Accelerated Benefit 2,4,5,5 Children s Term Rider 1 Disability Waiver Monthly Deduction 1 Minimum Death Benefit 5 Minimum Death Benefit Estate Protection 1,2 Policy Split Option 1 Federal Estate Tax Repeal Accelerated Death Benefit (1st Death) 2,4 Accelerated Death Benefit (without 1st Death) 2,4 Guarantees are backed by the claims-paying ability of the appropriate issuing company. 7 Current Assumption UL Indexed UL Lincoln LifeCurrent UL Lincoln LifeReserve UL Lincoln LifeReserve Indexed UL (Not available in New York) Universal life insurance protection with a 20-year secondary death benefit guarantee plus significant policy value growth Universal life insurance with strong long-term policy value growth Universal life insurance coverage with the potential for strong policy value growth through optional indexed accounts Provides valuable life insurance protection Provides clients with the ability to adjust premium payments and coverage amount over time to keep pace with their lives Provides significant policy value growth Provides clients with valuable life insurance protection Provides ability for clients to fund their policies to help ensure that they meet future financial needs Offers significant long-term policy value accumulation Ability to fund the policy to build account value to help meet long-term needs Provides upside potential of crediting rates based on external financial index combined with a 1% guarantee Coverage protection guarantee for the shorter of 20 years or age 90 Premium relief feature Zero loan spread on nonguaranteed basis Supplemental coverage rider Preferred loans after year 10 Asset-based bonus Durational interest bonus Three indexed account options Overloan protection endorsement Level term riders Retirement income High Early Surrender Values with Exec Rider Pay up survivorship Term vs. permanent/rated Annuity Max/IRA Max for older ages Key person/buy-sell funding Deferred compensation/162 Bonus/SERP LifeComp suite/non-409a Personal retirement Older Age Rated Cases/Tiered Premium Roth alternative College funding Personal retirement /Financing Annuity Max/IRA Max Pension max Term vs. permanent/rated Roth alternative College funding Key person/buy-sell funding Preferred nontobacco and tobacco Standard nontobacco and tobacco Simplified Issue Preferred nontobacco and tobacco Standard nontobacco 0 85 (15 85 in NY) Standard tobacco Simplified Issue Guaranteed Issue Preferred nontobacco and tobacco Standard nontobacco 0 85 Standard tobacco Simplified Issue Guaranteed Issue $100,000 $25,000 Guaranteed Issue, Simplified Issue and Full Issue $100,000 ($25,000 Guaranteed Issue) Spouse Term 1,2 Assured Distribution Endorsement Supplemental Coverage 1,2 Spouse Term 1,2 Disability Waiver Specified Premium 1 Disability Waiver Monthly Deductions 1 Accelerated Benefit (with Critical Illness) 2,4 Overloan Protection Endorsement 4 Change of Insured 1 Exec rider 1,2 Overloan Protection Endorsement 4 Supplemental Term Insurance on Primary Insured (Table reduction program not available with this rider) 1 Supplemental Term on Other Insured 1 Change of Insured Exec rider 1,2 Not all riders are available. 1 Available at an additional cost. 2 Not available in New York. 3 Please see prospectus for additional information, including possible additional costs. 4 One-time charge applied when benefit is exercised. 5 Not available in CT, MD and PA.
8 HELPING PEOPLE FACE THE FUTURE WITH CONFIDENCE At Lincoln Financial Group, we ve spent more than 100 years living up to the character of our namesake: integrity, honesty, and the belief in a better tomorrow. We provide advice and solutions to help people save for tomorrow, secure and maximize their income, protect themselves and their loved ones, and prepare for the unexpected. INCOME LIFE RETIREMENT GROUP BENEFITS Not a deposit Not FDIC-insured Not insured by any federal government agency Not guaranteed by any bank or savings association May go down in value 2011 Lincoln National Corporation Lincoln Financial Group is the marketing name for Lincoln National Corporation and its affiliates. Affiliates are separately responsible for their own financial and contractual obligations. LCN ECG 3/11 Z01 Order code: LIF-MENU-BRC008 This material was prepared to support the promotion and marketing of insurance and investment products. Lincoln Financial Group affiliates, their distributors, and their respective employees, representatives, and/ or insurance agents do not provide tax, accounting, or legal advice. Any tax statements contained herein were not intended or written to be used, and cannot be used for the purpose of avoiding U.S. federal, state, or local tax penalties. Please consult your own independent advisor as to any tax, accounting, or legal statements made herein. Lincoln Financial Group is the marketing name for Lincoln National Corporation and insurance company affiliates, including The Lincoln National Life Insurance Company, Fort Wayne, IN, and in New York, Lincoln Life & Annuity Company of New York, Syracuse, NY. Variable products distributed by broker/dealer-affiliate Lincoln Financial Distributors, Inc., Radnor, PA. Lincoln variable life insurance policies are issued on policy forms LN696, LN697, LN698, and LN699 and respective state variations by The Lincoln National Life Insurance Company, Fort Wayne, IN, and are distributed by Lincoln Financial Distributors, Inc., a broker/dealer. The Lincoln National Life Insurance Company does not do business in the state of New York, nor is it authorized to do so. Contractual obligations are backed by the claims-paying ability of The Lincoln National Life Insurance Company. In New York, variable life insurance policies are issued on policy forms LN697, LN698, and LN699 by Lincoln Life & Annuity Company of New York, Syracuse, NY, and are distributed by Lincoln Financial Distributors, Inc., a broker/dealer. 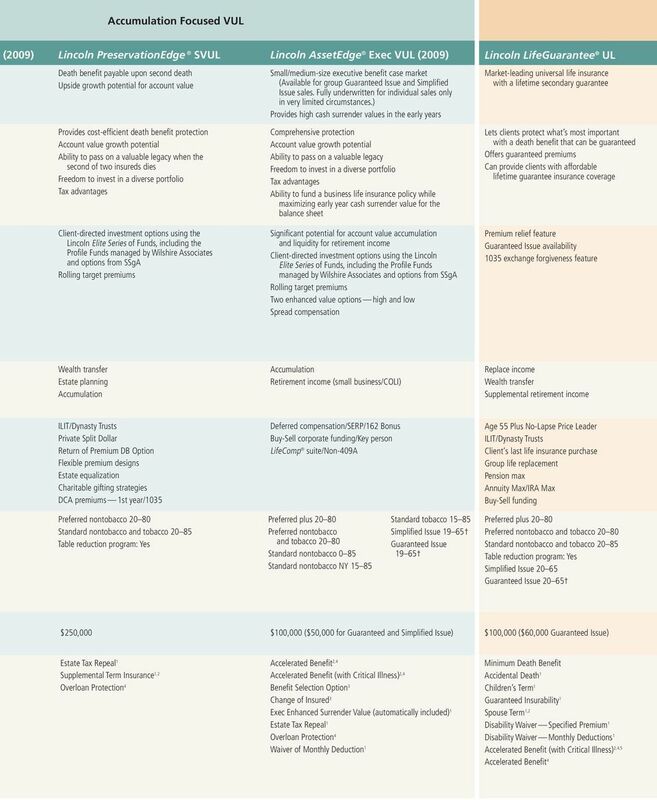 Policy values will fluctuate and are subject to market risk and to possible loss of principal. Products and features are subject to state availability. Limitations and exclusions may apply. 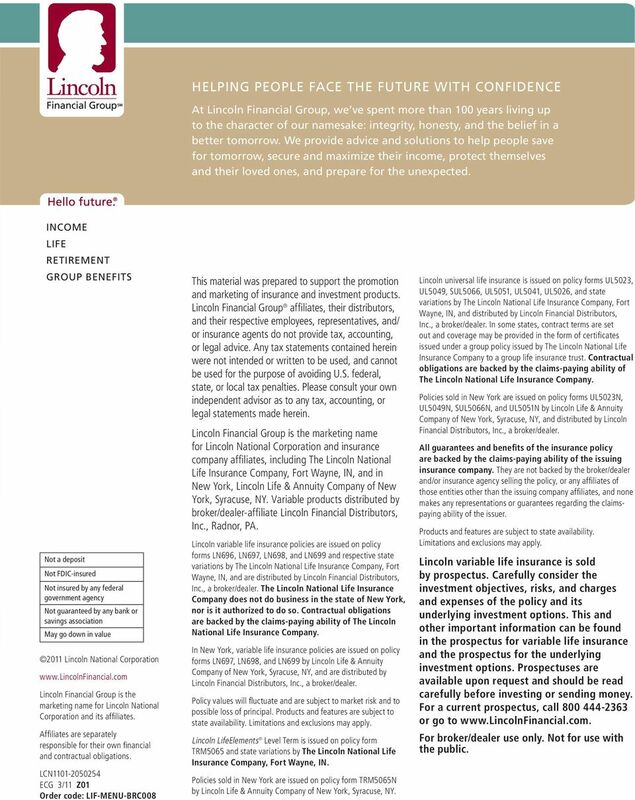 Lincoln LifeElements Level Term is issued on policy form TRM5065 and state variations by The Lincoln National Life Insurance Company, Fort Wayne, IN. 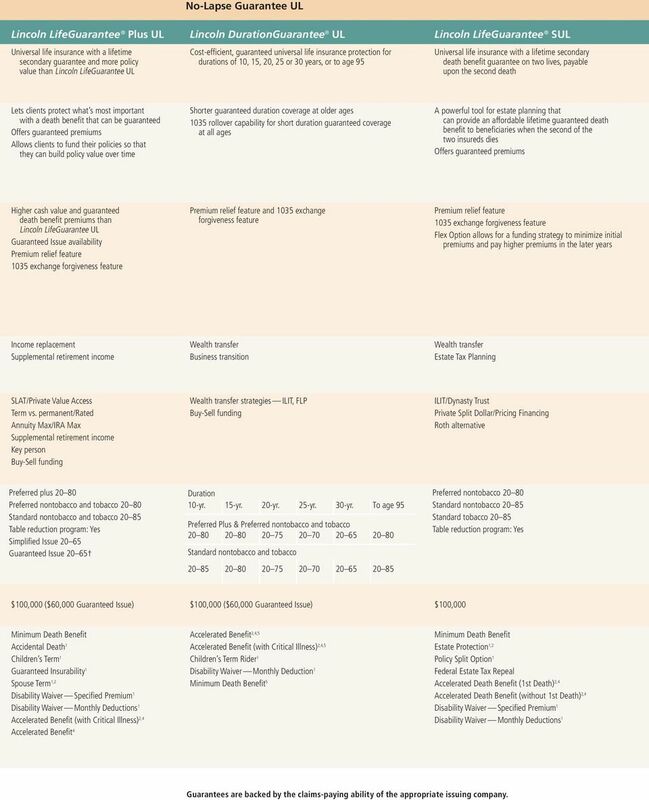 Policies sold in New York are issued on policy form TRM5065N by Lincoln Life & Annuity Company of New York, Syracuse, NY. Lincoln universal life insurance is issued on policy forms UL5023, UL5049, SUL5066, UL5051, UL5041, UL5026, and state variations by The Lincoln National Life Insurance Company, Fort Wayne, IN, and distributed by Lincoln Financial Distributors, Inc., a broker/dealer. In some states, contract terms are set out and coverage may be provided in the form of certificates issued under a group policy issued by The Lincoln National Life Insurance Company to a group life insurance trust. Contractual obligations are backed by the claims-paying ability of The Lincoln National Life Insurance Company. 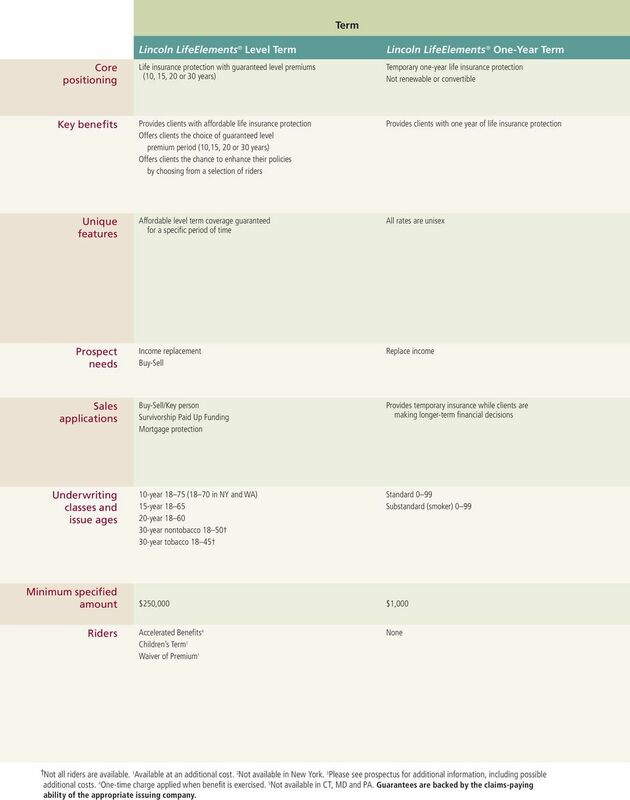 Policies sold in New York are issued on policy forms UL5023N, UL5049N, SUL5066N, and UL5051N by Lincoln Life & Annuity Company of New York, Syracuse, NY, and distributed by Lincoln Financial Distributors, Inc., a broker/dealer. All guarantees and benefits of the insurance policy are backed by the claims-paying ability of the issuing insurance company. They are not backed by the broker/dealer and/or insurance agency selling the policy, or any affiliates of those entities other than the issuing company affiliates, and none makes any representations or guarantees regarding the claimspaying ability of the issuer. Products and features are subject to state availability. Limitations and exclusions may apply. Lincoln variable life insurance is sold by prospectus. 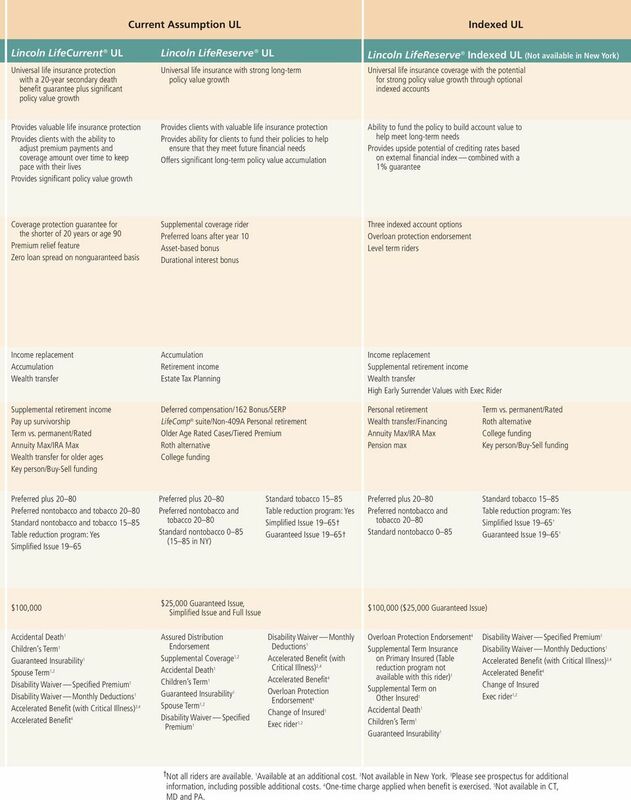 Carefully consider the investment objectives, risks, and charges and expenses of the policy and its underlying investment options. 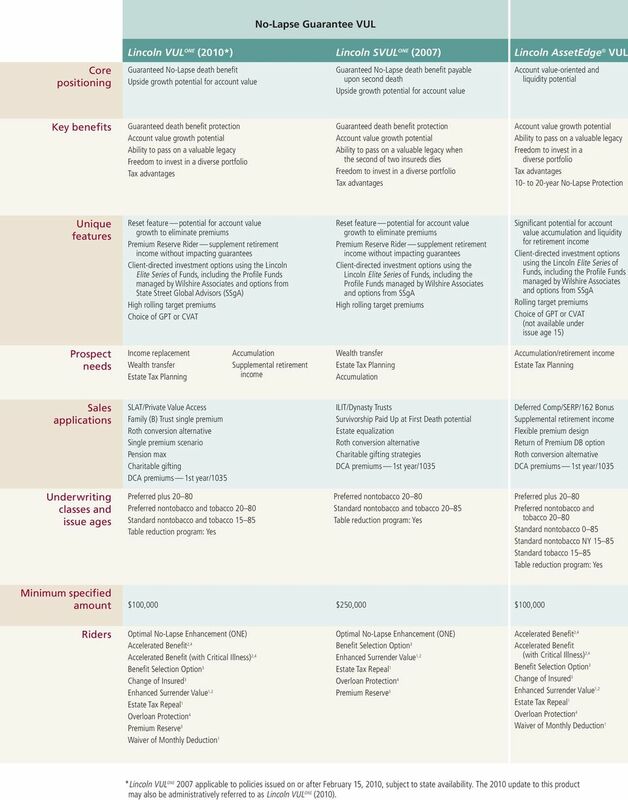 This and other important information can be found in the prospectus for variable life insurance and the prospectus for the underlying investment options. Prospectuses are available upon request and should be read carefully before investing or sending money. For a current prospectus, call or go to For broker/dealer use only. Not for use with the public.